Join us for the 12th Annual Patriot Golf Day Shootout, an event that raises funds for the Folds of Honor Foundation, a charity that provides scholarships to families of the fallen or wounded. In addition to great golf and great food, we pay tribute to those who have served and are serving and you are guaranteed to leave inspired. Once you register for the event, donations can be made by cash, check, money order, or through the online donation tracker to reach your commitment. (You are also able to donate to your own financial commitment). 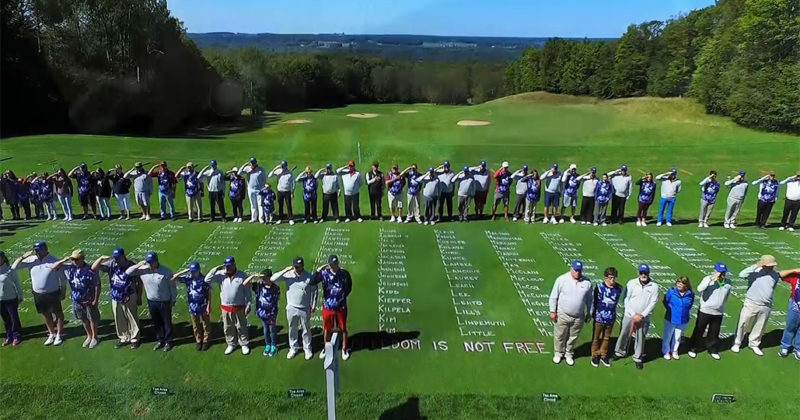 What is Patriot Golf Day? Since 2007, the Folds of Honor has provided educational scholarships to spouses and children of America’s fallen and disabled service-members. Returning home from his second tour of duty in Iraq, Major Dan Rooney, an F-16 fighter pilot in the Oklahoma Air National Guard, became painfully aware of the reality families face when a loved one in uniform is fallen or disabled. As his flight landed, the pilot announced they carried the remains of Corporal Brock Bucklin on board, asking all passengers to respectfully remain seated while his casket deboarded. Major Rooney watched as Corporal Bucklin’s twin brother walked somberly alongside the flag-covered casket to meet his family. Among them was the deceased Corporal’s young son, Jacob. Major Rooney ached as he thought of his own wife and little girls. Seeing the other side of war through the eyes of Jacob, was life-altering. Sadly, over half the passengers had disregarded the pilot’s request and deboarded. Major Rooney decided he had to do something. Not only would he pay tribute to American service-members and their families, he would live as a reminder among civilians that it is our duty to honor the sacrifices of those who preserve the freedoms we so easily take for granted. Major Rooney committed to spend his life changing the future of America’s grieving spouses and children. In 2007, he formed the Folds of Honor Foundation; a 501C-3 nonprofit organization dedicated to providing educational scholarships to the families of these heroic Americans.